and about the simple, honest ways to create all three. “Raising Cole” showed me a lot of things at one time. My first revelation was my own shortcomings as a father of two. I can’t tell you how much I want that same relationship with my children as Marc and Cole had. Not having considered myself a bad parent, I didn’t realize just how much more was possible in our relationship than what we have. What we have is what I have settled for. Then came the excuses. I didn’t have a father like Marc Pittman. My father was at times, possessed of a terrible temper that built a wall between us early in my life. I quickly learned to stay out of his way, and not ask too many questions. His unexplained bouts of rage left me as the youngest child, cowering under the bed at times. It left my two older sisters so black and blue that they were unable to dress out for high school Phys. Ed. classes. From an early age I loved sports. My first team sport was Little League baseball. There was only one problem. I was terrible at it, couldn’t hit a basketball if you threw it up to the plate. My dad struggled through watching me for part of one game. He never came back. Then I moved on to running track. I could run like the wind. Honestly, I couldn’t feel my feet touch the ground at times. Three hundred people or so would show up at our small town track meets. I remember coming around the last turn of many races, with the spectators standing and screaming my name. The bright lights and attention meant the world to a 13 year old kid. Especially since his father sat at home in an easy chair about a hundred yards away. I sometimes wondered if he had to turn up the television volume to drown out the cheers. Enough about the past. Today, I have a great wife and two children. We’ve been married twenty two years. I have the two greatest in-laws a man could have. They went out of their way to accept me warts and all. If there ever have been two people who reflected Jesus to me, it’s them. It’s as if life has finally balanced out, the good and the bad. “Raising Cole” introduced me to the two greatest concepts in the parent-child relationship. I’m talking about the Dead Man’s Talk, and the Love Wars. You don’t have to be with your son or daughter 24 hours a day for these concepts to work. On the day Cole Pittman died, there was nothing left unsaid between him and his dad because there was NEVER anything left unsaid between them. They not only encouraged a relationship that allowed this kind of talk, they nourished it. Marc says that some of what he heard made his heart swell with pride, and some made it drop through his stomach. As paninful as it might be to hear, do you really want to be in the dark about events in your child’s life? Now you’ve read the story of Cole, Chase, and Marc Pittman. You can’t wait to get started preparing your children to rock the world. There’s just one more thing. Are you as a father (or mother) ready? Do you have the foundation that will allow you to weather life’s storms? Marc Pittman wasn’t some wishy-washy, lets-see-what-kind-of-mood-dad’s-in-today father. It’s pretty much a given, if you live long enough, tragedy will strike your life in one way or another. My test came on December, 13, 2002. I got a phone call telling me that my sister and brother in law’s apartment building had burned down, and they couldn’t be located. I knew immediately they didn’t make it out. By chance alone, my sister and I had recently had a heart to heart talk leaving nothing unsaid. Don’t leave anything unsaid to anyone you love. Make it a habit. To weather these storms you’ll need a foundation that can’t come from you’re own understanding. You’ll need an unchanging, same today as it was yesterday source of strength. For me, that can only mean the Bible. I’ve heard it said that the best thing a man can do for his children is to love their mother. I can’t dispute the wisdom of that saying. For me, the best thing I ever did was to let them see their dad accept Christ. My son began asking questions about salvation, and followed me with his own decision not long after. My daughter saw her brother’s profession, and made her own a few years later. I’m forty-six years old. Statistically speaking, that means I have seen more days go by than are yet to come. I’m in pretty good shape for my age, but what does that mean? The Good Book says we’re not guaranteed the next breath. I loaded up my car, and drove the sixty-some miles to Dubberly, Louisiana. Stopping at the diner in town, I asked directions to Fellowship Cemetary. Five minutes later I stood at the fence, and walked through the fate. It wasn’t hard to find Cole. He has a beautiful monument. I put my hand on the granite stone for a minute, and opened my Bible and began to read. I don’t remember the passages now, but I do remember the feeling of peace that came over me. There was a little red football on the side of the marker. I placed a picture of Cole and Chase together that I had printed from www.raisingcole.com under the helmet. Then I walked away. Now it’s your turn. You’ve already accepted the challenge to be more than you were before you read “Raising Cole.” Get going. 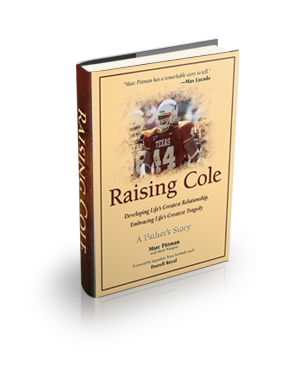 Thanks to Marc for the opportunity to share the impact on my life of “Raising Cole” with you. Thanks to Cole for being who you are. You have rocked my world. I wrote this letter to Marc Pittman and decided after his very positive response it would suffice as a review. I read your book a few months ago, just after I learned my wife is pregnant with our first child. Your book rocked every bit of my being with a truth I did not know existed. It forced me to question everything I thought I knew about father/son relationships. We’ve attended First Assembly in Shreveport for about 4 years and have never had the chance to meet you nor did we know your son Cole, but I can tell you the impact you and your son had on me is great. To be frank, I never had a desire to have children and intended to wait a while longer. My wife’s pregnancy was not intentional but the clear design of God. Most of my life, many people have sarcastically said “Just wait until you have one like you…” etc., which made me never want a child because I was such a handful of hell growing up. I made up my mind that if I were to ever have a child, it would have to be a girl because a boy would be too much like I was once. Those words somehow seemed to penetrate so deep that I learned to believe I was nothing but bad and I would pay the penalty for my grievances against my family and others with a son who would be my mirror image. In my mind, to have a son would mean I would reap as a father what I had sown as a son. But your book changed my long-held and flawed outlook, just in the nick of time. My former employers who also attend First Assembly purchased your book for me to read after they learned Rebecca is pregnant. I never knew that fathers and sons could be so close, share such a bond, be friends instead of foes, and love one another enough to share their inmost thoughts, desires and dreams with one another. I always assumed fathers and sons lived at odds with one another in an unending battle of pride and rebellion. On March 24, 2004, our 4-year wedding anniversary, my wife was confirmed pregnant. I began to pray that God would send me a beautiful daughter and spare me a life-long war of being the father of a bull-headed boy. You never hear “Daddy’s little boy” but “Daddy’s little girl” … and that, to me, had a wonderful ring to it. As I began reading your book, a shift of thinking began to occur, the subtle wind of God’s Spirit began blowing away my dusty old thoughts, my heart began to open, a light dawned in the darkness. As I read of Dead Man’s Talk, a father kissing his grown sons in public, a daring dad wrestling bears in bar room brawls to impress his kids, I began to wonder if my own ideas were just plain wrong, if my experiences were just mine and not the universal truth I thought they were. By the end of the book, after a solid month of praying for a girl, I told my wife that after reading your book I would be very happy to have a son. And it’s a good thing, because a couple of weeks later, the doctor confirmed to us what was once one of my greater fears, that I would soon be the father of a son. My wife is in her 28th week and she faces many challenges according to the doctors. From the first day, she has been classified as “High Risk” for miscarriage or pre-term labor. I believe God will allow her to carry to term and prove them wrong. After all, according to all the baby name books we’ve read, the name we decided on for our son has some strong meanings including “Winner” and “Victory of the people.” I believe Cole Anthony Shipp will win his battle against pre-term labor, just like the young man for who he will be named won so many football games, and just like your Cole, be the Apple of his father’s eye. Mr. Pittman, your son’s death is already making a profound difference in my son’s life. Thanks for sharing your story. I can’t wait to have my first “Dead Man’s Talk.” But I won’t be wrestling any bears! I met the author of this book before I even bought it. My husband and I had been to two book stores in Shreveport and both were sold out. Upon purchasing it, my husband read it in one day- unable to put it down. I read it next, more slowly, so that I could embrace each sentence, each thought, even rereading whole paragraphs just to let it sink in. Some parts brought a smile to my face as I could just imagine these events in Marc’s life taking place. Several times I stopped to praise God for the miracles He performed in the lives of the Pittmans. As I was reading, I would suddenly become aware of tears streaming down my cheeks. This story gives me hope for our children. If only we had more parents like Mr. and Mrs. Pittman, maybe today’s children would be happier. I have told basically everyone I have spoken to, since I read the book, of its powerful message, and I have urged them to read it themselves. In my mind, this book is for everyone- those with children of a young age and even those whose kids are grown. I think it’s appropriate for grandparents, aunts, uncles, stepparents, and those of us who aspire to have children someday. It’s about relationships- everyboody has those. Thank you for sharing your story with us. Marc Pitman opens his heart and soul in this book. This book is one of those books that you find yourself grabbing your children and never letting them go. I read it in one sitting and the next day I bought 10 more copies to give to every father I knew. I cried, laughed, and most of all was reminded how tomorrow is never promised. This book has wisdom for fathers that will change the way children are raised. Love is the main theme, and a true love between two men, which is hard to find today was clear. The men that I have given the book to, have read it, cried, hugged their children and passed the book on to others. A must read!! Do you love your kids? Do you love your spouse or significant other? Do you love your friends? If you can answer yes to any of the above questions, this book isn’t a good choice, it’s one that can instantly change all of your relationships in positive ways you can’t imagine that reading such a story will do. Marc Pittman isn’t a sappy psychologist or counselor, he is a tough country boy hailing from humble beginnings, and has not written a how-to book on the right and wrong ways to raise your kids. His story, one that is every parents’ dream as well as every parents’ nightmare, is so compelling that it is the first book I have ever picked up that I could not stop reading until I had turned the final page. This book (a true story) involves hunting camps, championship football teams, street fights and grit. It talks about successes, and involves a great tragedy. The author reveals his own failings in the process and the story lights understanding so well in the reader that you will instantly feel its’ effect on you. I cannot imagine anyone, no matter how tough or jaded, that will not feel chill bumps on the neck and tears roll down their cheeks before getting to the end of this incredible book. I have never thought so much of a novel that I felt the need to buy more than one copy, and had no intention of buying more than one of this one, either. I have also never felt compelled to share my feelings on a book here at this site before now. To date, I have bought 7 copies for my immediate family and a couple of friends, and I’ll be buying more. I hope that everyone I give it to experiences the same things I did. The few hours it took me to read this book are the best time I have invested this year, and every page was as compelling as the one before. Don’t just consider buying this book: RUSH to get your hands on it as fast as possible, and you will thank me later. Give it to your father, your mother, your kids, your family and any other friends that mean something to you. Then, don’t be surprised by the ways it changes your life or where your life ends up. It is sincerely that kind of an experience. I read Marc Pittman’s book last night. I could not put it down until I finished it. I laughed out loud and also had tears come to my eyes several times. Before I ever met Mr. Pitman several years ago, I had heard about him as my wife is from the same North Louisiana parish. Marc Pittman is a living legend there. I got to know the Pittman family as I followed a friend’s son football career at Evangel who was a teammate of No. 44, Cole Pittman.. Marc Pittman is like no one else I’ve ever met–he really is bigger than life with a heart as big as his 6″6″” 280 pound frame. (The story of him wrestling a 700 pound bear is true as a client of mine was in the tavern the night of the event.) And Judy Pittman–what a wonderful, loving person who is simply everyone’s friend. Cole’s death shocked the college football world, Shreveport, Austin and every place in between. Cole was the “All-American boy” in every way. I went to Cole’s funeral and graveyard services in hopes of simply paying my respects to this grieving family — but after witnessing the thousands of persons present and hearing Marc Pittman give the incredible eulogy as he stood next to his son’s coffin, I left the services with a new desire to tell my own beautiful children how much I love them as often as I saw them. The tragedy of Cole’s death changed my own relationships with my children, particularly with my own college-age son of whom I am sometimes very demanding. As I drove away from the funeral services, I called my own son who was away at college and (in tears) told him what I had just witnessed and how much I love him and how fortunate I am to have my great relationship with him. I will always remember the minister asking during Cole’s funeral, “How many Saturdays do you have left?” Last Saturday could have been the last of my life or the last of one of my beautiful children’s life. We just don’t know, do we? Marc Pittman’s book is a “must-read”, particularly if you’re a father. Because of his Christian faith, Marc is able to rise above his toughness as well as his grief and tell an heart-filled story that inspires all of us to honor and better appreciate the gifts of life and love that God has bestowed upon each of us. It’s the story of a father’s incredible love and a family’s tragic loss– but it is also a great inspiration as to how we can nurture and develop our own personal relationships with those we love. May God bless the entire Pittman family. I liked this book. No, I loved this book! It was a “can’t put it down” read throughout. The story, which is true, is about less than perfect people who build a relationship that is perfect for them. It tells of a tragedy but it is not about the tragedy. It is about what real people can do with their lives through tragic events. It is not a sad book. Although I cried. Reading “Raising Cole” was an uplifting experience. I hope we hear more from Mr. Pittman in the near future. "This book is a roadmap for parents seeking to create a lasting relationship that can withstand the storms of life." I HOPE READING MY STORY HAS opened your eyes to improving your relationships with God, family and friends and made a positive difference in your life. You too can make a positive difference by sharing this book with other people or contributing to the following fund. This fund will allow kids who are not as fortunate as Cole to have the same opportunities to reach out and touch other people and change lives.